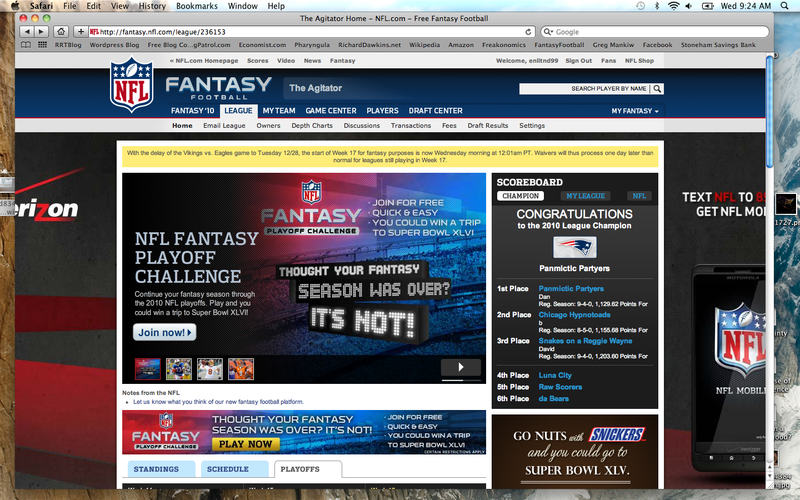 Home > Fantasy Football, radley balko	> Fantasy Football Champion! Congrats on the Fantasy win Dan! Picking up Michael Vick off the waiver wire was well timed. Best of luck next year, even though I hope to destroy your team! Thanks! Great job yourself. Ya, Vick was huge for me – I drafted Kolb, when he went down I was panicked but kind of fell into good fortune. I’ll be sure to attempt the repeat next year. Congrats.!! Now if you just could pick the next president, I hear they are taking bets in Vegas! Of course betting on Presidents is easy just go with who has the most money for the coming election.